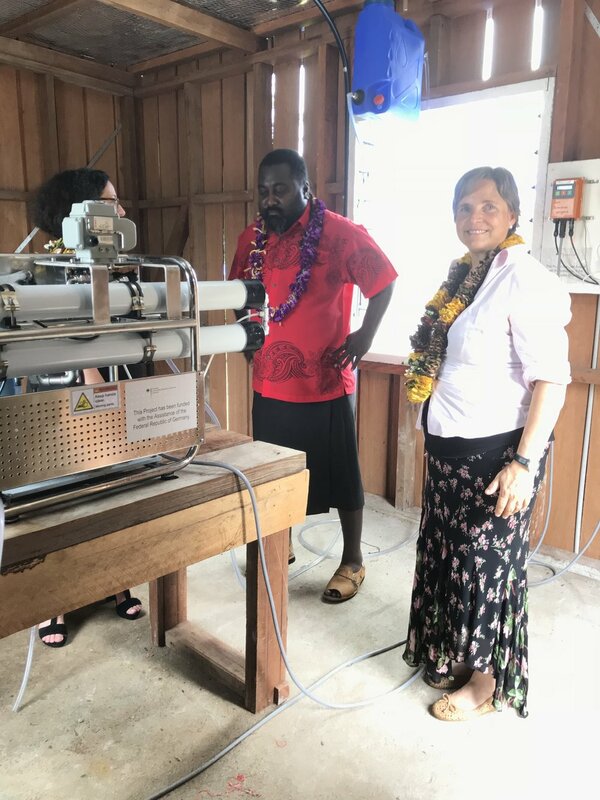 Joy spilled over as well as fresh water when the people of Samarae Island celebrated the opening of their clinic’s new solar-powered desalination plant. After decades of suffering from a lack of clean water, the Samarae Clinic in the Western Province of the Solomon Islands now has a reliable supply of safe drinking water, ending their chronic water supply problems. Moerk Water have installed a brand new unit, funded by the German Embassy in Canberra. Clean drinking water at this rural community’s only clinic means that mothers and their newborn babies will now be able to stay for several days before paddling home in their canoes, a far safer outcome than having to leave immediately after delivering their child, which was their only option until now. Before the desalination plant was installed, the community was dependent on collecting rain water, an unreliable source that does not exist during times of drought. A previous attempt to secure clean water by drilling a well failed when the water it discovered by the drilling team, from CleanWater4Life headed up by Richard Irosea , was found to be brackish. and an application was submitted to the German Embassy in Canberra. The opening of the plant was an occasion of great happiness for the community who put on a wonderful ceremony, attended by Barbara Brezger from Moerk Water, the Deputy Ambassador of the German Embassy in Canberra, Mrs Gerda Winkler who gave the keynote address and opened the plant, local chiefs, community leaders and the people of Samarae Island. The visiting dignitaries were warmly welcomed by local girls who presented them with garlands of flowers who then escorted them to a ceremonial hut for the opening ceremony. Mrs Gerda Winkler, German Deputy Ambassador, Canberra, congratulates the Hon. Silas Tausinga, MP for Georgia, after she officially opened the new desalination plant. “We are far away in Canberra, very far away,” Mrs Gerda Winkler, German Deputy Ambassador, Canberra, said. “So for us, trust is the most important element when we think of taking on a project like this. Mrs Winkler acknowledged Moerk Water Solutions as the inventor of this type of desalination plant and applauded them for creating a system that accommodates the location and its people. for our people to look after it. that never shall run dry." Our grateful thanks go out to our partner Dr. Dickson Borea from the Western Province Health Services' Gizo Hospital, represented by Mrs Freda Havea, Assistant Director of Nursing, who spoke about how having clean, running water inside the clinic meets the need to provide basic health care to the community, a key focus for the Western Province Health Services. “I want to thank the Western Province Government, Moerk Water, the Government of Germany and the communities around Samarae who have worked as partners in this project." Mrs Freda said in her speech. "I believe that this desalination plant will contribute greatly to the health of the people who will use it. "Samarae Clinic has moved forward in healthcare provision. for the people in the community." As with all our installations, our first priority was to equip the local people to operate the plant. A workshop was held at the YWAM base in Honiara that prepared the daily operators who were also trained to maintain the plant. In collaboration with their local team, YWAM's Mark Lerch will service the plant and conduct the ongoing training. Nialyn Nage (left) of Vona Lagoon, and Ristar Jonathan (right), nurses from the Samarae Clinic, attended the training and will assist in daily operation of the water plant at the clinic. A local child at the Samarae Clinic. Hon. Silas Tausinga, MP for New Georgia, Western Province, inspected the plant with Mrs Gerda Winkler, German Deputy Ambassador, and Barbara Brezger from Moerk Water.